We are ready for Spring here at Breslau Art Glass. 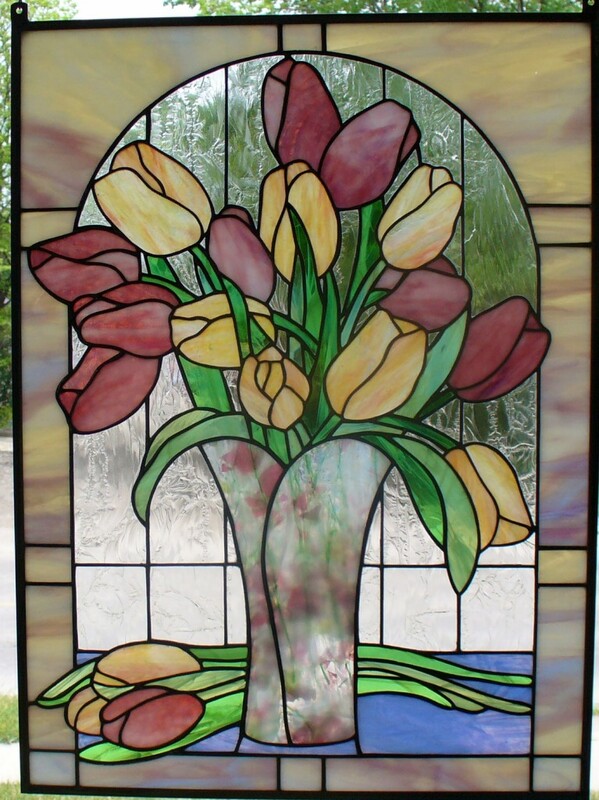 We have beautiful glass for your spring projects. It’s a little too early to garden just yet so why not make yourself some flowers that will never wilt! Feeling like Spring? A beautiful vase of pink and yellow of Tulips makes us smile! It’s time to try your hand at Stained Glass or Glass Fusing. Don’t delay – classes start Monday April 13/15 for Stained Glass and Tuesday April 14 th for Glass Fusing. see our Classes Page for information on registering. Working with Stained Glass can be a lot of fun and very rewarding. It gives you a sense of accomplishment when you proudly hang your panel for all to see. It is a great stress reliever as you concentrate on the work at hand and leave everything else behind. It adds colour to your home and colour can change your mood. A panel may add privacy as well. In this pretty window of red flowers and a hummingbird the background glass is a milky white which allows light in but you can not see through it. No time for classes? Then we would be happy to make that custom window for you. Drop in for a visit and see what we can do! Another Fused Glass Ornament Workshop! Remember those brave souls who fought for our rights and freedom. FUSED GLASS ORNAMENT WORKSHOPS ARE HERE!